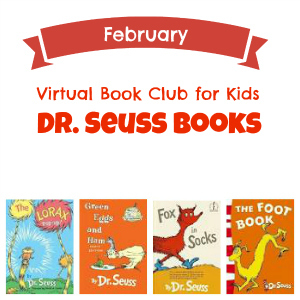 I am so excited about the February Virtual Book Club for Kids author, Dr. Seuss. Almost everyone has a favorite Dr. Seuss book. The Virtual Book Club for kids is open to anyone who wants participate and share favorite books and activities by Dr. Seuss. 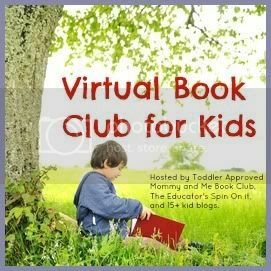 Read on to find out how to link up to the Virtual Book Club for Kids. The Virtual Book Club for Kids will not only be a great place to link up your ideas for Dr. Seuss books, it will also create a huge database of Dr. Seuss books and activities. The linky party of ideas can be used for celebrating Dr. Seuss' birthday and Read Across America which is March 2. If you have a beginning reader, it can be a little tricky to find the correct level of Dr. Seuss book for your young reader. It seems like all of the Dr. Seuss books should be appropriate for beginning readers, yet some of them are written on a second or third grade independent reading level. If you are working to choose a book for the month on the correct reading level for your child or class, check out this list by Montessori Tidbits. She has Seuss books leveled from Kindergarten to 2nd grade. Once you've picked your book and shared it with your family or class, create a book activity to go with your Dr. Seuss book. This could be a craft, activity, cooking project, etc. Create a blog post and come back on February 18 and link it up with the Virtual Book Club for Kids. If you don't have a blog, you can come back on February 18 and share your ideas in the comments section of the post. Yay! I love Dr. Seuss! I think I will be ready by the 18th, thank you so much for explaining all this. I have to update your button on all my blogs! So cute! I am planning on participating this month! I'm so excited!